"Tessa" is a 29.5" red varnish appaloosa AMHA mare. 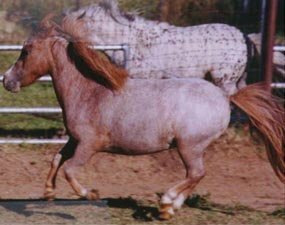 She was sired by "War Lance", who is a full brother of AMHA National Multi Color stallion "Carousel Custom Design". Thanks to Tommy and Dawn Thompson of Lost Spoke Appaloosa Miniature Horse Ranch, Benson, Arizona, for sharing this photo of their lovely little mare with us.